Upper material made of high quality, water-resistant full grain leather. Black and anthracite colour, waterproof, breathable GORE-TEX® membrane, safety reflectors on sides and back, durable lacing section with deep lacing hooks, easy-threading eyelets, removable insoles, excellent tip protection against wear andabrasions, cushioned PU midsole, excellent grip thanks to the non-slip tread design of the soles. Protection according to EN 17249 and EN 20345. Forestry boots are designed for extreme loads. 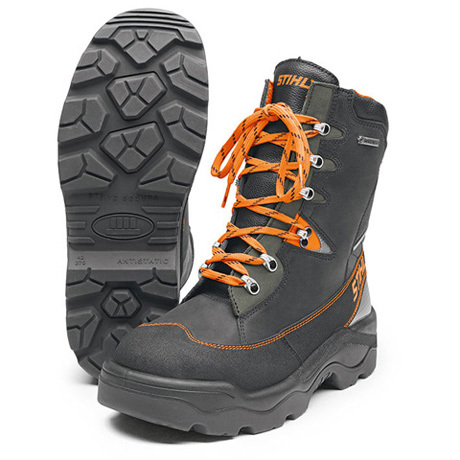 STIHL carries out rigorous laboratory testing on the soles to ensure quality and durability. 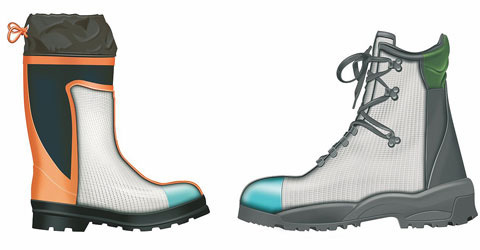 Protective boots for chain saw work. Cut protection is over the entire front of the foot plus the tongue. 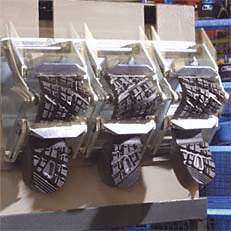 Please bear in mind that no safety boot or shoe can offer absolute protection from injury!